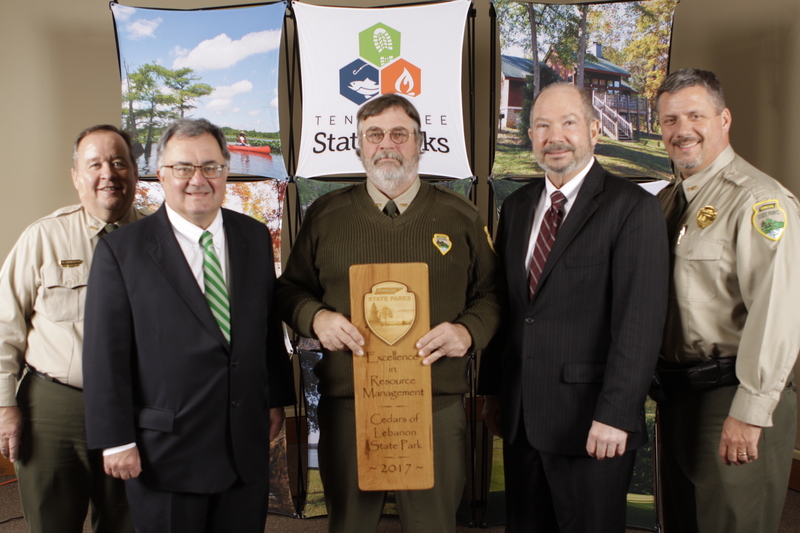 NASHVILLE – The Tennessee Department of Environment and Conservation (TDEC) recognized Cedars of Lebanon State Park with the 2017 Award for Excellence in Resource Management for protecting rare plant species, preserving historical records and more. “Cedars of Lebanon has done a phenomenal job to protect and preserve the natural beauty of the area as well as the cultural significance of the park,” said TDEC Deputy Commissioner of Parks and Conservation Brock Hill. The park has successfully revitalized 75 acres of degraded open meadow. The area was formerly used by private landowners for crop production and grazing. Park staff developed a land management plan that includes prescribed burns, chemical applications for invasive plant control, thinning of fence rows and planting of native grasses. In conjunction with TDEC’s Division of Natural Areas and the Tennessee Plant Conservation Alliance, park staff housed and cared for the critically impaired Running Glade Clover plant species. The park will relocate more than 200 plants to park property and state natural areas within the Cedars of Lebanon State Forest. The historical significance of the park is obvious in the craftsmanship of some of the facilities as well as the stories passed down within the community. Several original structures remain that date to the park’s founding during the Works Progress Administration in the Roosevelt-era. Several cabins and the iconic Cedar Forest Lodge received upgrades in 2017 that maintain the space’s historic character. With a grant from the Tennessee State Archives, hundreds of documents and artifacts have been catalogued and preserved for the public to explore. In addition to physical keepsakes, the park plans to record oral histories of area families whose land became park property in the late 1930s. Other improvements include the construction of a half-mile ADA-compliant trail funded by a $150,000 Recreational Trails Program grant. Once completed, the loop will take visitors through the Nature Center’s Butterfly Garden to the eastern end of the meadow. 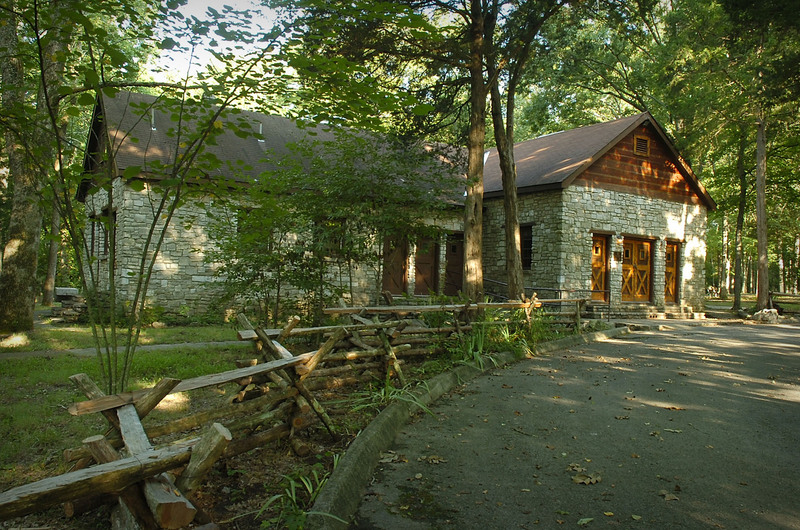 The Annual Park Awards of Excellence – which honor five parks annually – were created to recognize exceptional work within Tennessee State Parks. The 2017 award winners were recognized at the Tennessee State Park annual park management conference in January at Montgomery Bell State Park. Parks are nominated by TDEC staff and voted on by Tennessee State Park leadership. Additional 2017 winners include: David Crockett Birthplace State Historic Park (Interpretation), Henry Horton State Park (Innovation), Montgomery Bell State Park (Sustainability) and Sergeant Alvin C. York State Historic Park (Park of the Year). 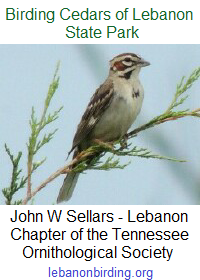 This entry was posted in Announcement and tagged Cedars of Lebanon State Park, friends of cedars of lebanon, Tennessee State Parks. Bookmark the permalink. Awesome Park! Awesome people running it!